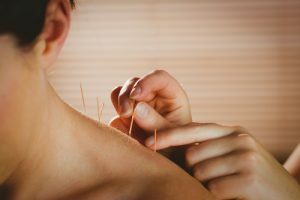 With origins in Traditional Chinese Medicine, Acupuncture is based upon a theory of life energy or ‘chi’ that flows through interconnected meridians within the body – similar to an electrical circuit. Just like an electrical circuit at home, where blockages can cause power failures, disruption within the meridians can lead to a deterioration in health or life energy. Blockages lead to symptoms such as pain. Pain is often felt at the site of the blockage (but not always) and your acupuncturist is trained to identify where best to release the blockage (and subsequent pain) using needles. However, the good news is that acupuncture offers so much more than pain management, its a holistic approach to look at dis-ease and dis-function that effects many aspects of one’s health. At Beach House Chiropractic we embrace the combined approaches and benefits derived from both traditional and modern physical healthcare. Acupuncture works extremely well alongside Chiropractic, Yoga and Sports Therapy, ensuring our clients receive a more complete solution to improved health and wellbeing. Acupuncture has been chosen by people as a complementary health choice for many centuries. At Beach House Chiropractic, our team are trained in both traditional eastern acupuncture and acupuncture and ‘dry needling’ or ‘western acupuncture’. The needles used are very thin and most clients feel nothing at all when the needle enters the skin. Our Chiropractors use dry needling within a normal Chiropractic appointment. Traditional acupuncture approaches are available with our Sports Therapist Jo Sturgess in combination with or separate to a Sports Therapy appointment. For more details and to discuss the right acupuncture approach for you, please call our clinic on (01903) 660094.